Camillo Branz (1870-1948), Ray’s great-grandfather. My favorite reason for doing genealogy are the people you meet along the way. Our little family website has drawn the attention of Tyrolean descendants from all over the world. Sometimes they turn out to be cousins; often they are family genealogists searching for clues to their own ancestry. The name “Branz” immediately rang a bell! Jean Branz Daly is a prolific contributor to the Genetti website (and my first cousin, once removed). 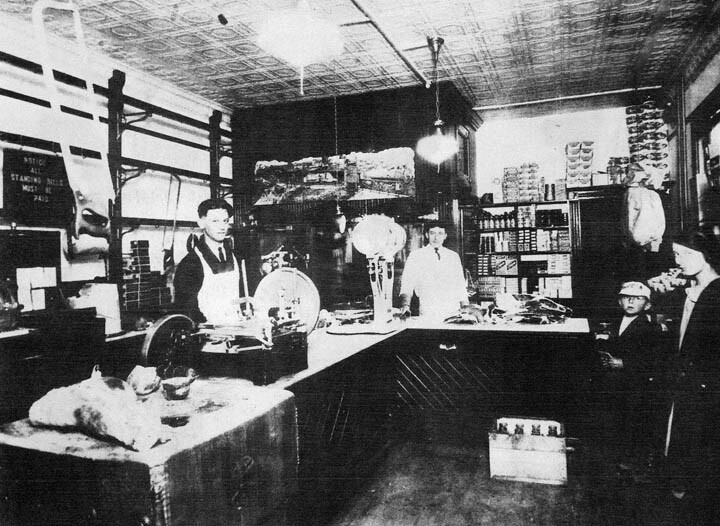 Jean’s mother, Erminia Genetti, married Henry Branz and they lived in Freeland, PA. I wondered if Ray was related to Jean’s father’s family. Since Ray is also a genealogist and has detailed research about his own family tree, he wrote back immediately with the answer. Yes, we had many overlaps in our shared family histories. The Branz family was from the village of Sanzeno in the Val di Non, not far from the Genetti’s ancestral village of Castelfondo. Ray’s great-grandparents, Camillo and Maria Rosa, immigrated to Pennsylvania in the 1890’s, settling in Nuremberg, PA for a short time. They soon moved on to the coal mines of Wyoming. 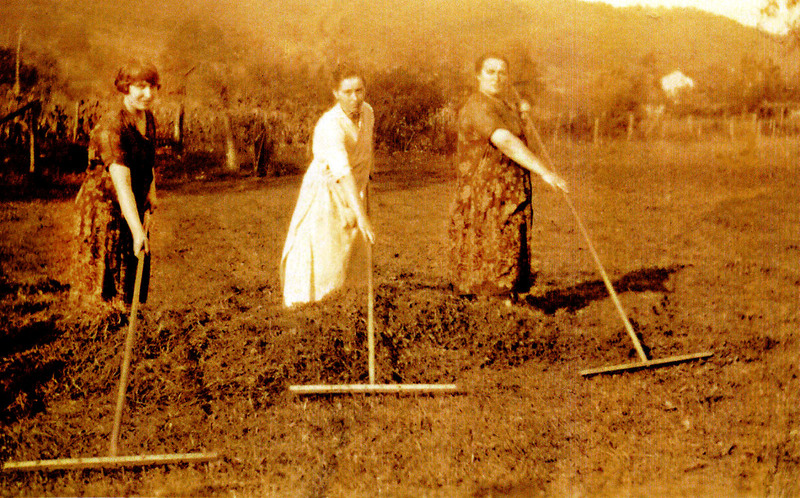 In 1904, the family finally putting down roots in southern Illinois. From Ray’s calculations, he and Jean were indeed distantly related as 6th cousins, once removed through the Branz family. Since I have Genetti and Marchetti family who lived at the same time and in the same place in Pennsylvania as Ray’s great-grandparents, we are sure our ancestors knew each other. 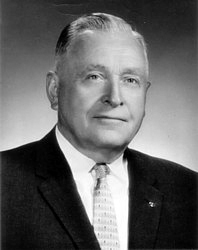 Plus different branches of the Genetti family also worked the mines in Wyoming and Illinois. 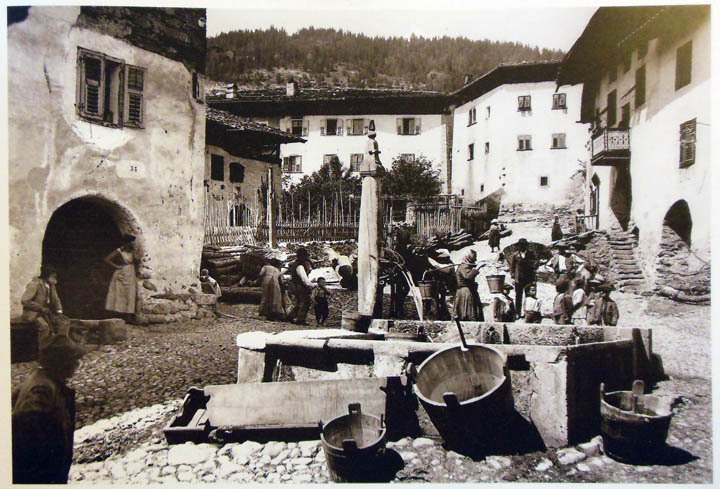 Since Tyrolean immigrants who shared a common dialect (such as Nones from the Val di Non) often socialized and lived in the same communities, it’s likely that Camillo and Maria Rosa also knew the Genetti families who lived in these states. I always marvel at how truly small the world is! 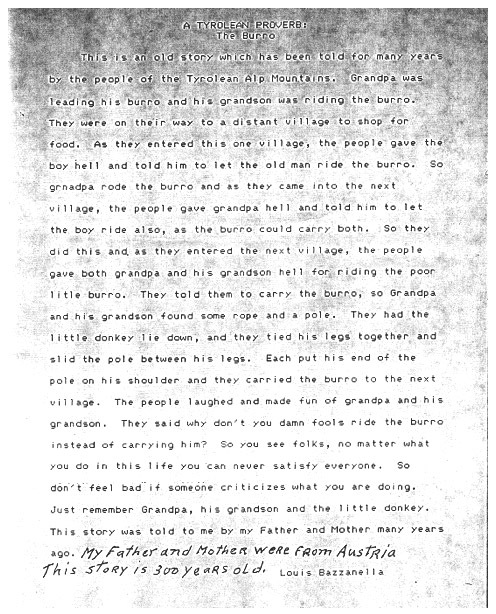 Below is the original typed copy of the Tyrolean Proverb shared by Ray Branz. I hope you enjoy it as much as I did! Many thanks Ray. I look forward to future conversations about our shared heritage. 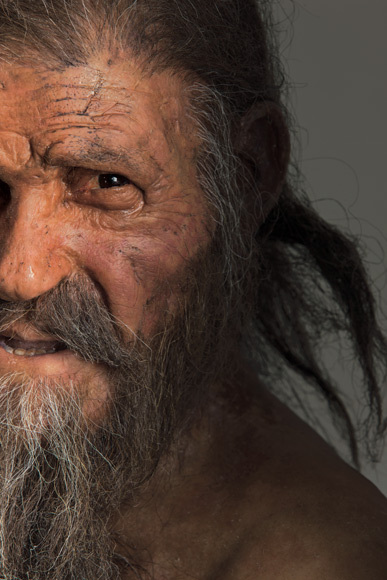 This life size model of Otzi, created by Dutch artists Adrie and Alfons Kennis, is on display at the South Tyrol Museum of Archaeology in Bolzano, Italy. Photograph by Robert Clark – National Geographic. For all of you Ötzi fans, The Iceman has been making the news recently. PBS just aired an informative NOVA episode, “Iceman Reborn”, filming the unique process used to create an identical replica of the Tyrolean mummy. Ötzi’s twin will be available to scientists who are unable to observe the famous ice mummy in person. Paleo-artist, Gary Staab, worked for five months to reproduce the first of three copies utilizing cutting edge techniques in 3-D printing combined with his extraordinary talent of observation and artistic skill. I loved the program! In other Ötzi news – The Iceman Speaks! Well … not quite. Scientists are in the process of recreating Ötzi’s vocal tract, including his vocal cords and mouth. The experiment will then combine the replica with software that will approximate what Ötzi’s voice sounded like 5,300 years ago. Of course scientists have no idea what language was spoken by the famous Tyrolean, since the earliest written inscriptions by humans appear around 1500 BC. Ötzi’s birth date is between 3359 and 3105 BC. According to project coordinator, Francesco Avanzini, “We should be able to recreate the timbre of his vowel sounds and, I hope, even create simulation of consonants.” How exciting! Click here to read the article “Can mummies talk? Scientists find out” by The Christian Science Monitor. See more photos of Ötzi, published in the March 2016 issue of National Geographic, click here.